This little bear is a memory of one of the most incredible men in my life. Greg Carroll became a great friend of myself and Bono in the early 80s. He died at the age of 26 in a motor accident in Dublin in 1986, and he left a giant hole in our lives. Greg was a Maori, and at his tangi a mate of his handed us this one eared teddy bear. It was Greg’s, and it has been with us ever since… a fragment of Greg’s reality gone but never forgotten. U2’s “One Tree Hill” was written for Greg and all the great men and women whose river reaches the sea too quickly. Greg’s teddy smiles when his good ear hears it played. Teddy Tingley belonged to my oldest brother who gave him to me the day I was born. I remember when I was 3 years old, we were heading off on holiday by train. I had just settled down in the carriage with my brothers for the journey and as the train started moving I glanced out of the window to see to my horror, teddy sitting on my bundle of comics on the station platform. Thanks to my mum roaring like a mad woman out the window “the teddy!, the teddy!, I just want the teddy!”, some kind person ran with teddy as the train picked up speed, reaching up to the window just in time for Mum to grab him. This mad woman then had to sit down and face the other passengers for the rest of the journey. To hell with them and the comics, teddy was what mattered. 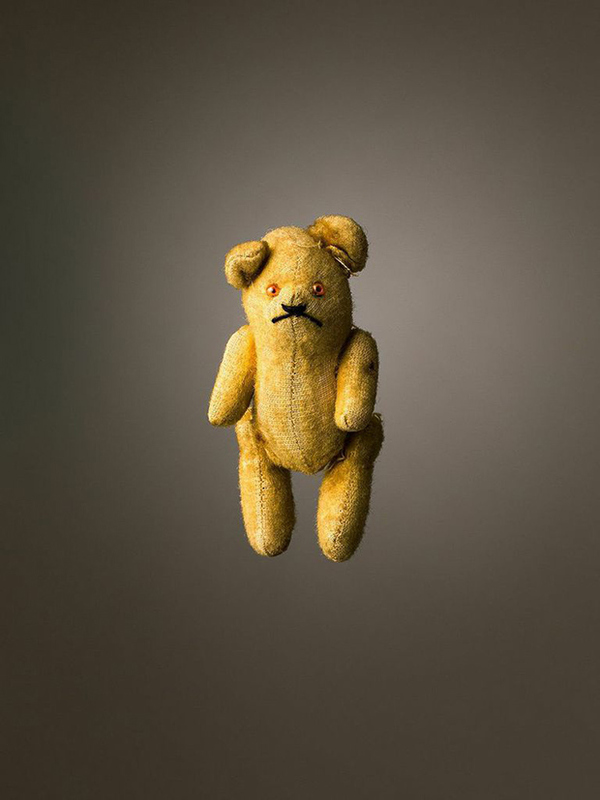 For his book Much Loved, photographer Mark Nixon documents beloved teddy bears treasured by children long into adulthood. 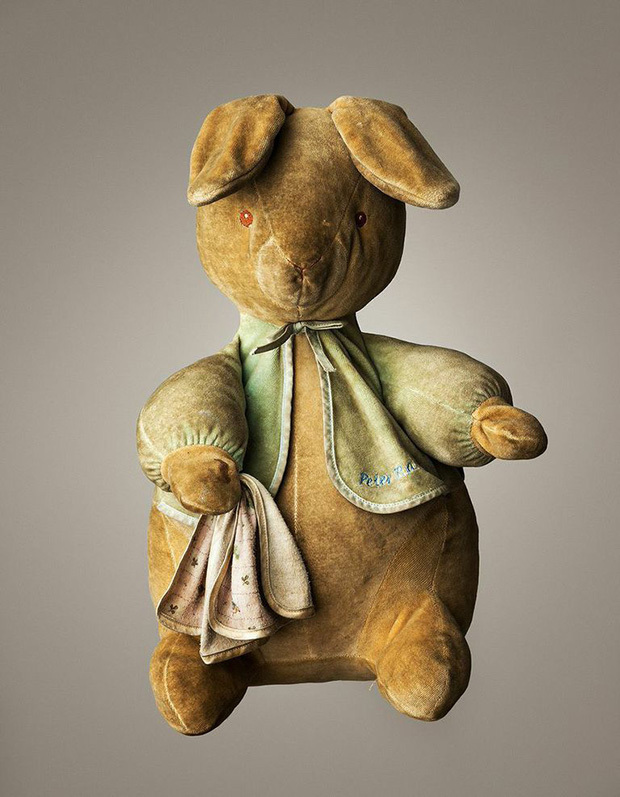 Inspired by his young son’s attachment to his Peter Rabbit, Nixon sent a call for a Teddy Day in his studio, with submitted toys ranging from the tender age of five to a wizened one hundred. On the opposite page, the soulful creatures are accompanied by personal stories of loss and recovery, sorrow and joy. 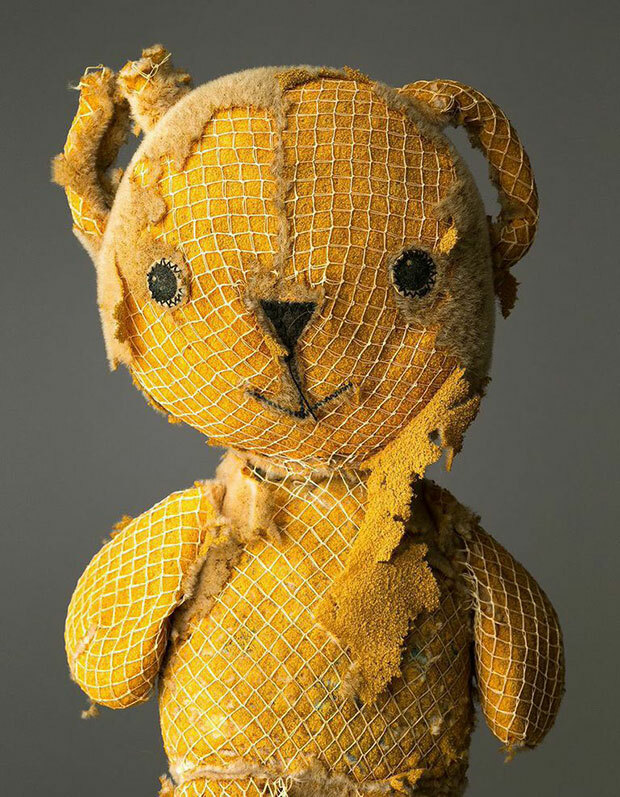 Each bear bears the wounds of love, chewed apart by child mouths or carried about until they are ripped at the seams. Their faces contorted by affection, the toys become vivid reminders of innocence lost, of the beauty of growth and decay. 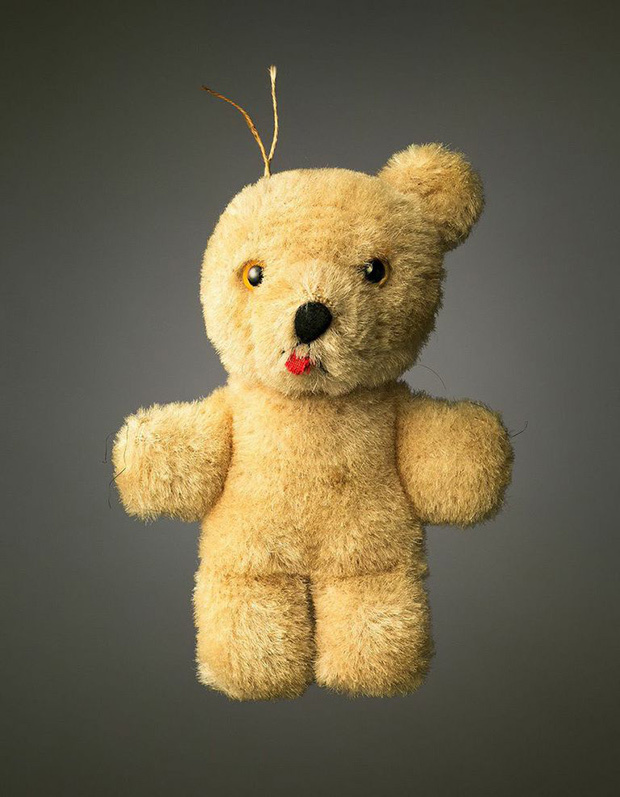 Nixon explains that teddy bears can serve as what psychologists call a “transitional object,” helping infants and young children adjust from separation with the mother; into adulthood, we can continue to nurture this intense feeling for the soft toys. Against Nixon’s earnest and simple gray backdrop, the bears and bunnies appear profoundly vulnerable, as if pulled from a space of play and thrust into unknown territory. Here, their heartfelt narratives collide with Nixon’s careful and forensic gaze, and they emerge as cherished documents of individual children as well as a universal childhood. After their humans have passed away, many of the small creatures remain, passed down from parent to child and imbued with an ineffable ability to comfort, console, and pacify. Peter Rabbit was the inspiration for this project. Calum’s ninety-nine-year-old great-grandmother Eva bought Peter for Calum when he was born and he has slept with him every night ever since. Of the scores of teddies and soft toys now residing in black sacks in the attic, Great Granny knew what she was doing; Peter stuck. I think I only ever called him Panda. I remember clearly snuggling up with him in bed as a child, which is probably why watching my son, Calum, with his teddy spurred me on to starting this project. 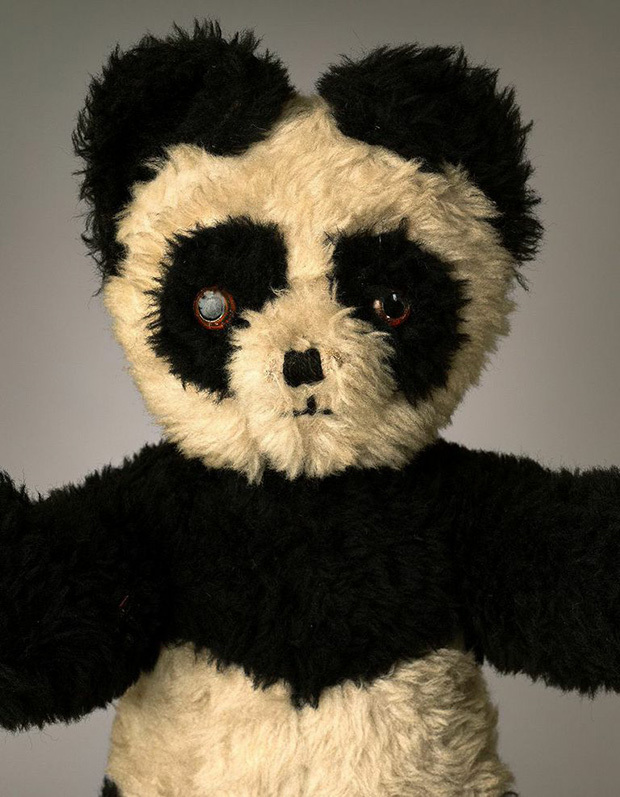 As my interests focused elsewhere (girls & music mostly), Panda spent many years on top of the wardrobe in the spare room of my mother’s house, from there to a cardboard box in her attic and finally the box with the ultimatum, take it with you or it’s going in the bin. So he joined the scores of other soft toys belonging to my children, ending up in a trunk in the spare room. I have just taken him out of the trunk to photograph him for this, he smells a bit musty but I have decided to keep him beside my computer in my studio while I work. 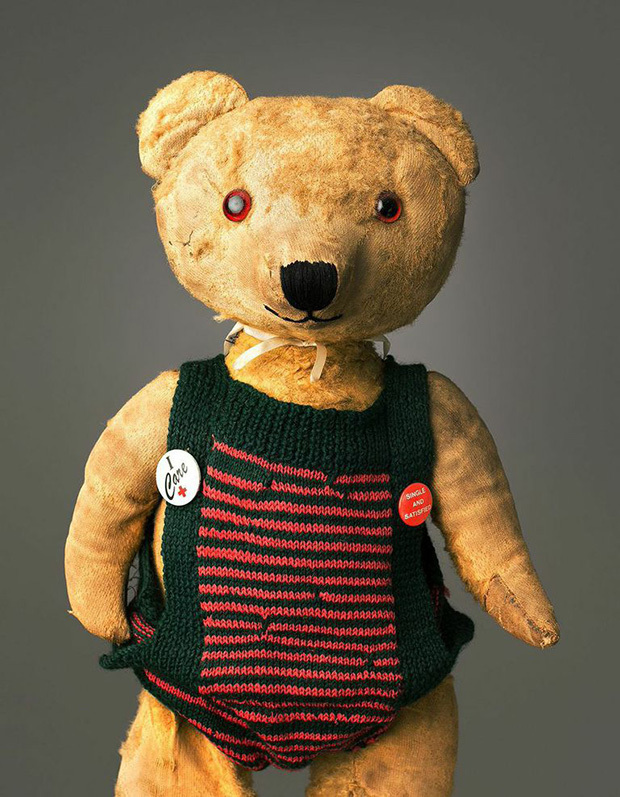 Sinead Keogh writes, “Ted was hand-made for my husband Tom when he was born. My mother in law sent Ted up from Cork when we got married in 2005. Our baby Tom was born the following year and on his first night home from the hospital I was shocked to find my husband had placed this mankey Ted in the basket beside my pristine newborn!! I banished Ted to a shelf in the bedroom where he now happily stays. 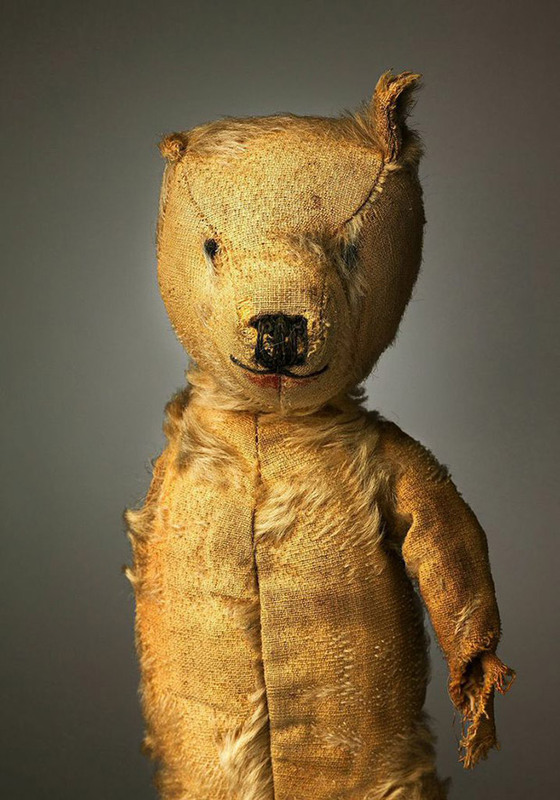 Gerry and his brother Mano both owned this bear as children. Gerry took to carrying him around as an adult, after watching Brideshead Revisited and renamed him Alowishes. He often spoke of him on his radio show. There is still a trace of lipstick visible that Gerry’s mother Maureen applied at one stage. One Eyed Ted has now been passed to Gerry’s daughter Babette. My teddy has had quite an interesting life so far. Pink Teddy was born when I was six months old, on Christmas Day 1988. He was bright pink back then with a red waistcoat and we were instantly inseparable. We have only been apart for a few nights since because as much as I would love to bring him everywhere with me I would just be too terrified to bring him to a music festival! He lost his waistcoat and mouth during my childhood and then a friend of mine gave him a glitter glue necklace which has lasted for a good ten years now. He accompanied me to the Gaeltacht during my school days and he became known as Teddy Bn Dearg. (Gaeltacht is the Irish language word meaning an Irish-speaking region. Children are sent to summer school here to learn the Irish language). He also came to college with me and we spent many years living the student life in Maynooth. But it was during this time that the greatest tragedy befell Pink Teddy. It was the week before Christmas break and we had a huge house party on the Wednesday night. There was one particular person that we were hoping would not show up, a girl who had caused trouble at a house party around Halloween and who knew she wasn’t welcome. We had an epic night and the following morning I woke up feeling very happy that the party had been such a success but also a little hungover! But what happened next is burned into my memory forever. 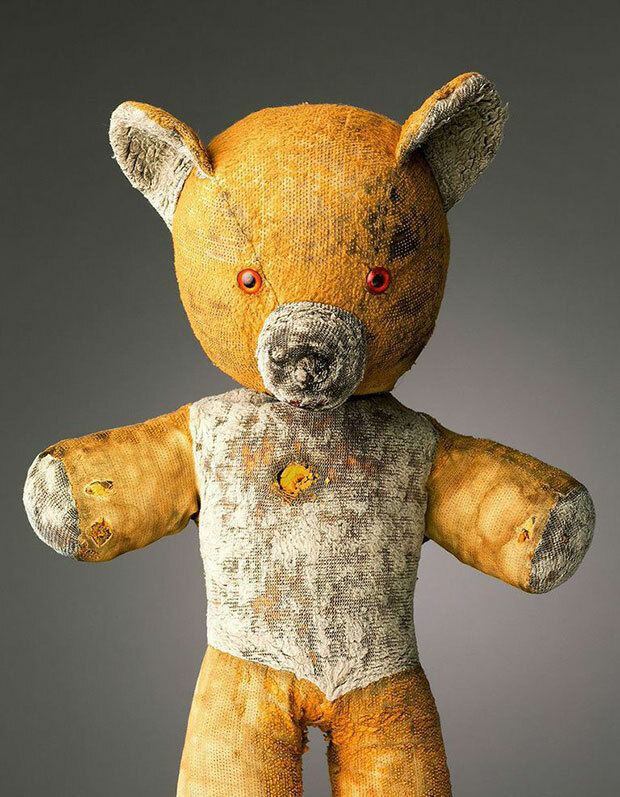 When I got up to survey the damage to the house I saw something truly awful… Pink Teddy had been ripped limb from limb… I was in shock, horror… I knew only one person could possibly have done it and of course we had stupidly left the door unlocked with people still straggling home after we had gone to sleep. I was consumed with anger but then the tears started to flow. My housemates woke up fairly quickly when they heard me wailing and they sprang into action. Someone got me a cup of tea and a jumper and then someone carried out the delicate operation of retrieving Pink Teddy and wrapping him up in a blanket. I was distraught so I rang my mam and bawled down the phone. She reassured me that my great aunt Rosaleen could fix Pink Ted for me and said she would come and collect me on Friday afternoon. But this failed to lift my mood so my housemate Ben who is a musician decided to do something amazing to cheer me up. He went into his room for a while and when he came back out he said ‘I have a surprise for you’. He sat down with his guitar and started to play the Pink Teddy song that he had just composed and I loved it so much that I started crying even more. I still listen to it from time to time but it’s hard not to cry when I hear it. I know it’s not a musical masterpiece but it means so much to me. 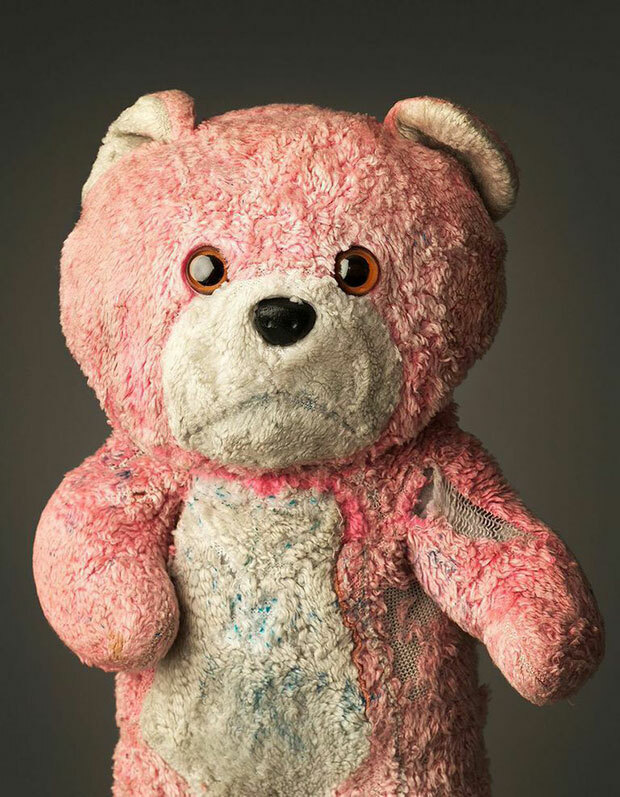 My great aunt Rosaleen managed to fix up Pink Ted and she even gave him some more stuffing because he had been getting rather skinny looking. That was nearly four years ago and he is still looking good although now his left arm is sort of hanging on by a few threads! He has been practically everywhere with me and he even loves archaeology and heritage as much as I do. When I was 2 years old, I named him Ear Open. I used to carry him around by his ears (which have holes in them). He has seen me through every stage of my life and is a very understanding, resilient creature. He started losing his fur roughly 10 years ago. I brought him to the Teddy Bear Hospital (see Melissa Nolan entry in this book) to see about getting him some new fur, but I was told his teddy leprosy was incurable and he would need a total new fur which could never match his original one. I decided against him having this procedure, so now his once bright, glorious yellow fur is hanging off, but I love him all the more for it. Over the years, Teddy has undergone several changes. When it debuted on “The Trouble with Mr. Bean,” it had a smaller head. Two episodes later, its head reached its current size, but its “eye” wasn’t present until Bean placed gold thumb tacks on its face. 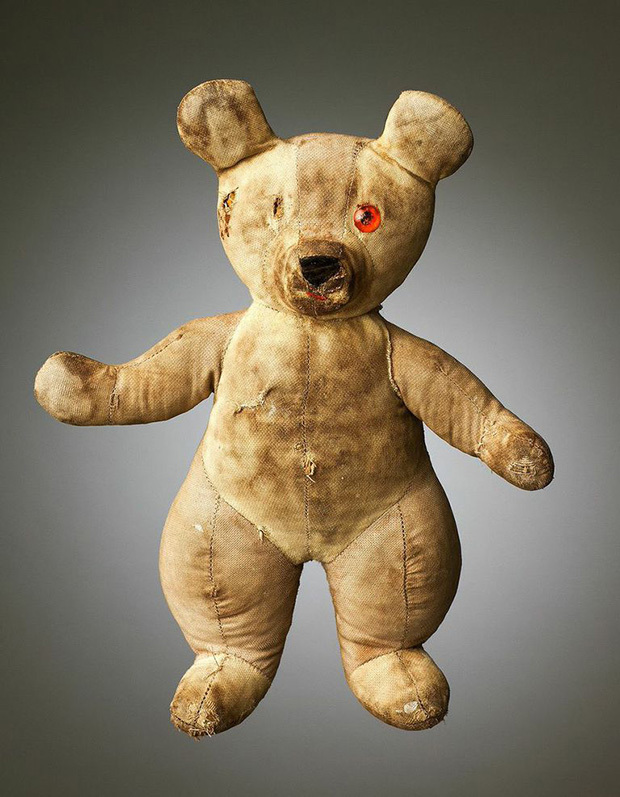 The “eyes” have since been replaced with two small white buttons sewn over Teddy’s face, giving it a distinct image. Teddy is Mr. Bean’s teddy bear and perhaps Mr. Bean’s best friend. 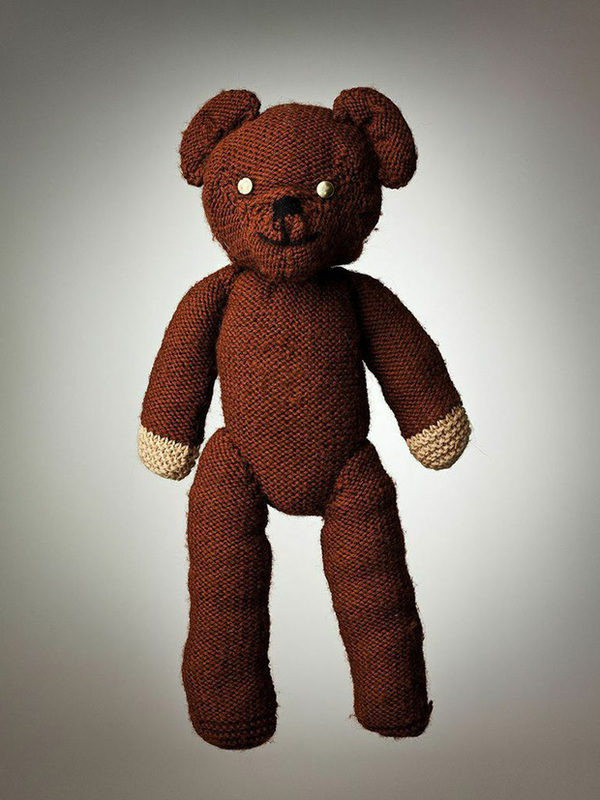 The bear is a light dark brown, knitted oddity with button eyes and sausage-shaped limbs, invariably ending up broken in half or in various other states of destruction and disfiguration. Although Teddy is inanimate, Mr. Bean often pretends it is alive. For example, when Mr. Bean hypnotizes Teddy, he snaps his fingers and the bear’s head falls backwards as if it has fallen asleep instantly (Bean used his finger to prop Teddy’s head up). Mr. Bean behaves as if the bear is real, buying it a Christmas present or trying not to wake it in the mornings. The bear is often privy to Mr. Bean’s various schemes and doubles as a dish cloth or paint brush in an emergency; it has been decapitated (“Mr. Bean in Room 426”), used as his paint brush (“Do-It-Yourself Mr. Bean”) and shrunk in the wash (“Tee Off, Mr. Bean”). Teddy is also Mr. Bean’s “pet” in “Hair by Mr. Bean of London” and is used to win a pet show. The Teddy that was used in filming sits in the windshield of the replica of Mr. Bean’s mini that is on display at the National Motor Museum. Big Ted used to belong to Mairead’s brother David, he was named Big Ted because he was bigger than Mairead at the time. David held a race in the back garden between Mairead and her sister Elizabeth to see who would win him for a week. Mairead won, and never gave him back! He travels to Donegal with her on a cushion sitting on the handbrake of the car. Maeve brought Peter in to see the Much Loved exhibition. Maeve’s only attempt at knitting was to make Peters playsuit, it is full of imperfections as you can see but that only makes it more unique. Up until the exhibition, Peter was languishing in the spare room. Since coming in for his photo shoot, he is now a celebrity in the house and has pride of place in Maeve’s bedroom.